Thank you Gerry for that great tip. 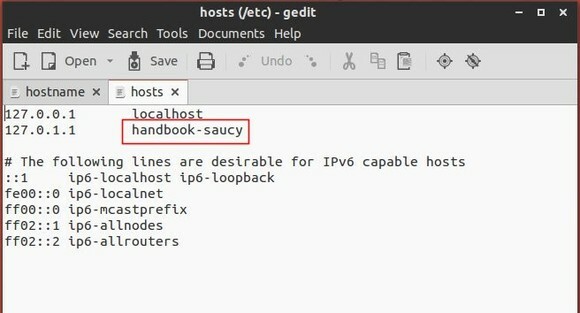 I recommend ‘gksudo gedit /etc/hostname /etc/hosts’ instead of ‘sudo gedit /etc/hostname /etc/hosts’. Thank you! I love Ubuntu community. Someday I`ll contribute (when I`m good enough). You’re welcome Robert. I’m sure you will be contributing back to the community in no time. Cheers. pls help me how can i save it ? I am new to ubuntu and facing a problem, Please help me out. where I changed the hostname as ” Ravi_Chin” and now I want to change ” bhupendra” into Ravi. bhupendra is your login name, you may create a new user account in “User Account” utility (search it from the Dash) and log in with that account. When changing FQDN is is best practice to reboot the OS. only way to ensure all services are sourcing a good FQDN, reboot! hi, I have OS microwatt base ubuntu booting use FD and I have two computers connected via the network and each of these computers boot using the same FD, hostname must be the same between the two computers. Can You give me a solution to prevent conflicts with two same hostname.